The Cameroon Field Station (hereinafter Cameroon FS) is located in the tropical rainforest in the East Province of Cameroon, Central Africa. 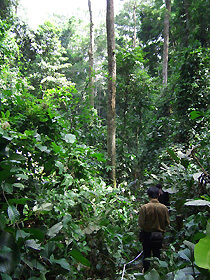 Unlike field stations in other regions, which have their offices in universities or in the capitals of the respective countries, the Cameroon FS is a base for field research located right in the tropical rainforest. In the tropical rainforest area on the western edge of the rainforest of the Congo Basin, there are plans to establish national parks called Boumba-Ngoko and Nki, and the Cameroon FS is located at the entrance into these projected park areas. It is about 900 kilometers from Yaounde, the capital of the country, and requires a trip of two or three long days using a four-wheel drive vehicle to fight the rough roads, which in the dry season are bumpy like a scrub board and turn into muddy swamps in the wet season. There is no doubt that its location is inconvenient, but it is situated in a very beautiful forest area, with the boundless rainforest stretching out from Congo Basin and with the Dja River, a tributary of the Congo, flowing nearby. Research in this region has been carried out since 1993. 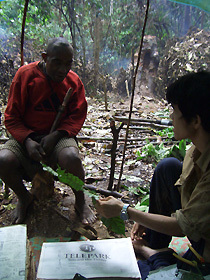 The major theme of the research concerns the utilization of forests and shifting cultivation of the Baka hunter-gatherers and farmers of Bantu or East Adamawa language groups, who depend heavily on the rainforest. The FS is used as a base for investigating the hunter-gatherers and farmers carrying out shifting cultivation in the neighboring area. It is also used as a space for organizing collected materials, exchanging information and holding simple seminars. Further, thanks to the development and improvement of the power-generating unit, computers, communication facility, etc., the FS is being used effectively as a center for field research, equipped with the function of linking the field with the research laboratories. The major activities in FY2004 were as follows. The first job upon arrival in the camp is to make a shelter. Leaves of Marantaceae plants are being prepared for the roof. This is a job for women, but in participant observation, doing everything firsthand is important. A quadrat is set up in the forest for conducting a vegetation survey. 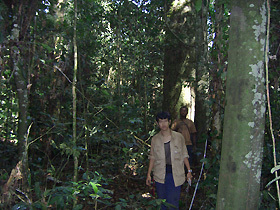 Carrying out vegetation surveys in the bright secondary forest is hard work due to the thick undergrowth. During the vegetation survey in the quadrat, first the local name of each tree is identified, and the trees' diameter at breast height (DBH) is measured. Next, specimens from each tree type are gathered and an ethno-botanical investigation is carried out regarding usage and other knowledge. Having a smoke during a break from the survey. Valuable information can sometimes be obtained from chats during these breaks. Back at the camp, the gathered plant specimens are organized and their local names and usage are rechecked. The gathered specimens are dried using fire in the field. For short-term surveys, they are sometimes soaked in alcohol and placed in a plastic bag, to be dried after they are brought back to the herbarium. Measuring the weight of a bushpig caught in a trap. After cutting it up and distributing it, each family cooks the meat, and the cooked meals again are distributed among the families. The entire process is surveyed. The survey tracks the meat from the phase of distribution to ultimate consumption. Gathered materials are measured. All the harvest during the morongo (long term foraging expedition) period is recorded by type. 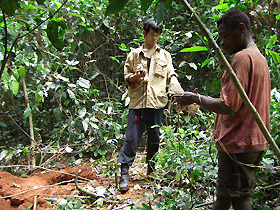 Conducting a vegetation survey near a wild yam gathering site. The location is confirmed by GPS. Having a meal of wild yam and animal meat. Surveys of everyday meals are also important research. 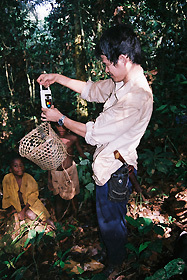 In November-December 2004, KIMURA Daiji (ASAFAS faculty member) visited Cameroon with funding from a Grant-in-Aid for Scientific Research, and with the help of graduate student INAI Hiroyuki (enrolled in FY2003), who was dispatched around the same period, undertook maintenance of the FS that had been established along the River Ngoko (downstream of the Dja River). The two existing buildings are made of local materials, with frames of wood coated with mud and roofs of raffia palm leaves, and therefore, require periodic re-roofing and mud-wall recoating. In addition to this work, a new communication system was introduced to reduce the costs of communication by satellite telephone, which had turned out to be costly in the prior year. Further, a simple generator using kerosene was equipped, thus improving the electrification system, which until that time was limited to a solar battery. This drastically improved the electric power supply, which until that time had relied on unstable solar energy generation in the tropical rainforest environment. 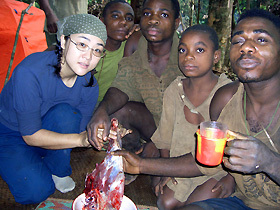 HATTORI Shiho (enrolled in FY2000), who had been in Cameroon since the previous fiscal year, conducting research, extended her period of stay by four months from May 2004 and continued her research on the utilization of forests of the Baka hunter-gathers. 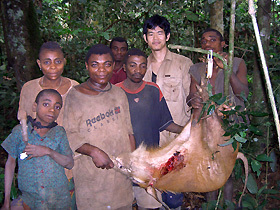 YASUDA Akihito (enrolled in FY 2004), whose trip was supported by private financing, visited Cameroon from August 2004 to January 2005 to conduct a survey on bush meat use and the relationship between nature preservation projects and community livelihoods. He carried out a broad-based investigations on the usage and distribution of bush meat, and also surveyed the area near Benoue National Park in the North Province. To provide on-site education for the above two students, ICHIKAWA Mitsuo (ASAFAS faculty member) was dispatched to Cameroon from August 4 to September 2. 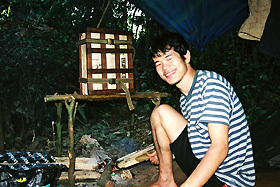 KIMURA Daiji visited Cameroon from mid-November to the end of December 2004, to carry out maintenance of the FS and also provide guidance to INAI Hiroyuki, who was conducting surveys on freshwater fisheries on the Ngoko River. 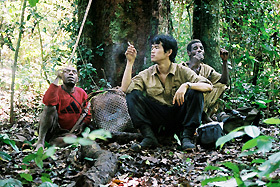 Starting in January 2005, SHIKATA Kagari (enrolled in FY2000) was dispatched for a study on shifting cultivation and changes of the forest environment caused by it, along with YASUOKA Hirokazu (enrolled in FY1999) who was dispatched to research the use of forest resources by hunter-gatherers, especially on the availability of wild yam. Both are aiming to receive their doctorates soon. In addition to ASAFAS, researchers and graduate students of Kyoto University Graduate School of Science, Hamamatsu University School of Medicine, Faculty of Education of the University of Yamanashi, Faculty of Medicine of the University of Tokyo, Faculty of Education of Yamaguchi University, etc. are using the Cameroon FS as a research base. The Field Station thus serves as a research base for Japanese researchers in this region. 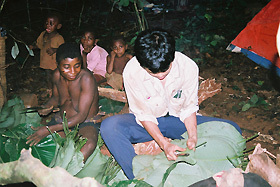 Joint research with local researchers has been conducted since 1993, when research in Cameroon began. In September 2003, a "Memorandum of Understanding" (MOU) on academic exchanges was exchanged between the Faculty of Humanities and Social Sciences of the University of Yaounde 1 and the Kyoto University Graduate School of Asian and African Area Studies. A remaining task is the promotion of joint research and education in Cameroon, including education for graduate students, and securing financial sources to this end. 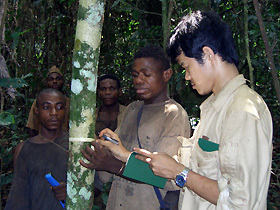 In the East State of Cameroon, where the FS was established, surveys are being carried out in close contact with WWF-Cameroon, which promotes forest conservation projects, Cameroon's Ministry for the Environment and Forestry (MINEF), experts of the German government's aid organization (GTZ) who are supporting forest conservation projects, Cameroonian government officials, researchers, students, staff in charge of project promotion, etc. In December 2003, together with these organizations and institutions, a first seminar was organized in Yokadouma, the capital of the Boumba-Ngoko district, and on February 16, 2005, a second seminar was organized, this time in Yaounde, the capital of the country. At the seminar, presentations were given, from the Japanese side, by three ASAFAS students (YASUOKA Hirokazu, SHIKATA Kagari and HATTORI Shiho), and on the Cameroon side by Olivier Njounan, graduate student of Yaounde University. In addition, Dr. Leonard Usongo, who serves as coordinator of the Jengi Project in WWF-Cameroon, gave an introduction to the project. Participants included people from WWF and GTZ involved in the implementation of the conservation project in the East Province of Cameroon, Dr. Ngima-Mawoung (the FS's local counterpart) and Dr. Nga Mdongo from the Faculty of Humanities and Social Sciences of Yaounde University, Dr. Kai Schmidt-Soltau, a German expert, and researchers of the National Herbarium of Cameroon and the Wildlife Conservation Society (WCS). Dr. KANAI Tamana, a medical officer at the Japanese Embassy in Cameroon, also participated in the seminar. For details of this seminar, please see the report by HATTORI as noted elsewhere. As for the local seminars, on both occasions, the graduate students played a major role in contacting and coordinating with local organizations and institutions, securing the venues, etc.